Alchemy in the Kitchen: Rhubarb and Strawberry Popsicles - a sophi-stick-ated Summer treat ! Rhubarb and Strawberry Popsicles - a sophi-stick-ated Summer treat ! It’s been over a hundred years since the 11-year-old Frank Epperson went to bed, leaving a soda on his porch (so the story goes). After a freezing night, he reclaimed his drink, which had frozen around a stir stick left in the glass. I don’t imagine the soda remained untouched by the local fauna overnight and I guess if he’d looked closely he would probably have seen one or two drowned insects trapped in the world’s first recorded ice pop. In 1923, Frank patented this frozen treat (insects not included! ), calling it the “Epsicle”. His kids had a better name for it and it’s been the “Popsicle” ever since - that’s Ice Pop or Ice Lol(ly) to you and me depending on what part of the country you are from. Anyway, whatever you call it, Summer just wouldn’t be the same without flavoured ice on a stick. Over the years, I have gone through various unsophisticated favourites: the luridly lime-y Loop the Loop, the Iceberger, the Wibbly Wobbly Wonder, Solero, and Magnum but I have less of a sweet tooth now. Sweetened poached fruit combined with Greek yoghurt makes a creamy but relatively healthy (and sophi-stick-ated) alternative. Ice pop molds are available in most supermarkets and kitchen stores at this time of year. Put the fruit in a medium saucepan with the apple juice or water. Place over a medium heat, and cover. As it cooks, the rhubarb will release a lot of juice, which will provide enough liquid to poach the fruit. Place the fruit in a sieve over a bowl and leave to cool, catching any excess fruit syrup in the bowl. 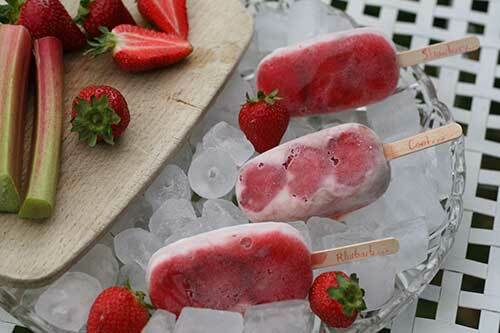 Line popsicle molds with slices of strawberris and drizzle over a little of the syrup to form a thin outside layer on one side of the popsicle. (If you are using upright molds, this won’t be possible so just mix some chopped strawberries through the yoghurt before freezing.) Place in the freezer until the thin layer of syrup has frozen. 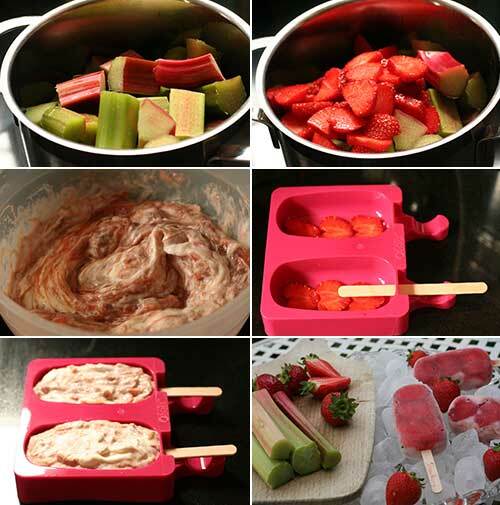 Spoon the yoghurt mixture into the molds, insert popsicle sticks and freeze for at least 4 hours or overnight. You will have some fruit syrup left over. This will store in the fridge for up to a week and is delicious mixed with sparkling water or dry cava. These summer popsicles look great, love the flavour! Sophi-stick-ated? Too funny, Hester. Love how they're bursting with fruit and really interesting about the history - had no idea. I mist buy the same moulds! Your popsicles look so tempting and refreshing! And with my beloved rhubarb... (though I think it's finished here). Hester, interesting and fun story behind the first recorded ice pop - I had no idea! And, of course, your rhubarb and strawberry popsicles look absolutely delicious and elegant - Greek yoghurt is wonderful in ice cream pops, I tried it once with different fruits and loved that too, so I just know that these were fabulous! Nice summer post, Hester! I love your popsicle maker. I haven't seen anything like that here. These moulds look great. Love the way you can really see the fruit. That little bit of history is very cute too. I like your sophi-stick-ated summer treat for sure. Talk about a treat I don't have to feel guilty about eating! Love the history lesson. I'll be you're right and there were bugs in the mix. These look great and one knows exactly whats in them unlike the shop ones. I didn't know how the name came from and thanks for the story! In Japan it's called "Ice Candy"... it's totally off and I had no idea what popsicle is when I came here. :) Love your "sophi-stick-ated "! 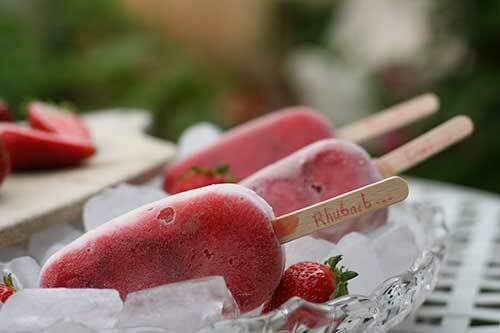 Enjoyed reading your post, and your rhubarb and strawberry popsicles look so yummy!